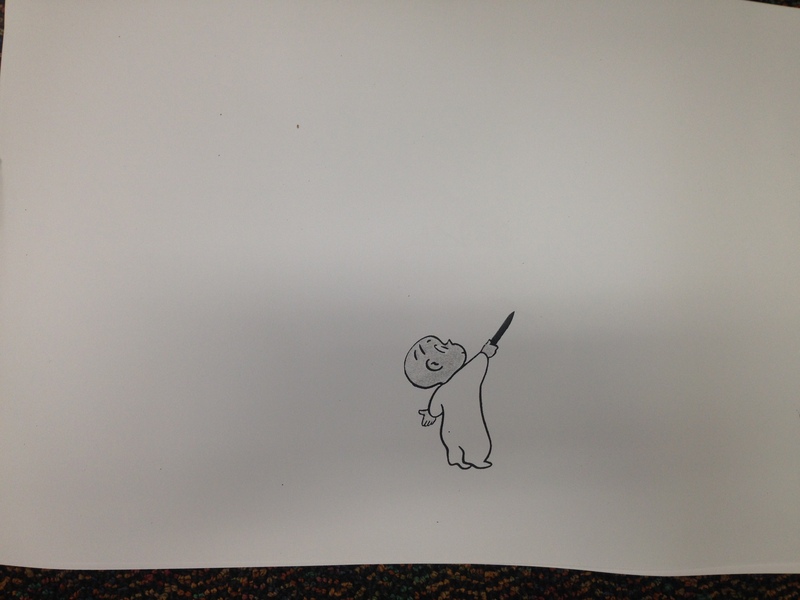 After reading the 2014 Caldecott Honor Book, Journey, about a bored girl who creates a daring and dangerous adventure for herself using a red crayon, I was reminded of a far simpler version about a footed pajama-wearing, pointy-nosed, wide-eyed, almost hairless little graffiti artist named Harold. 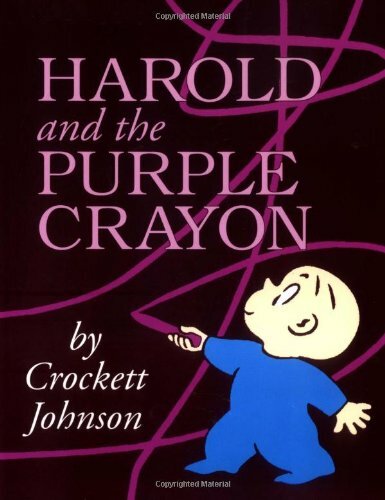 Harold and the Purple Crayon, by Crockett Johnson, has timeless appeal, as he wields his one and only crayon to both create and solve one problem after another, until he draws himself to bed, and the crayon slips from his sleepy hand to the floor. 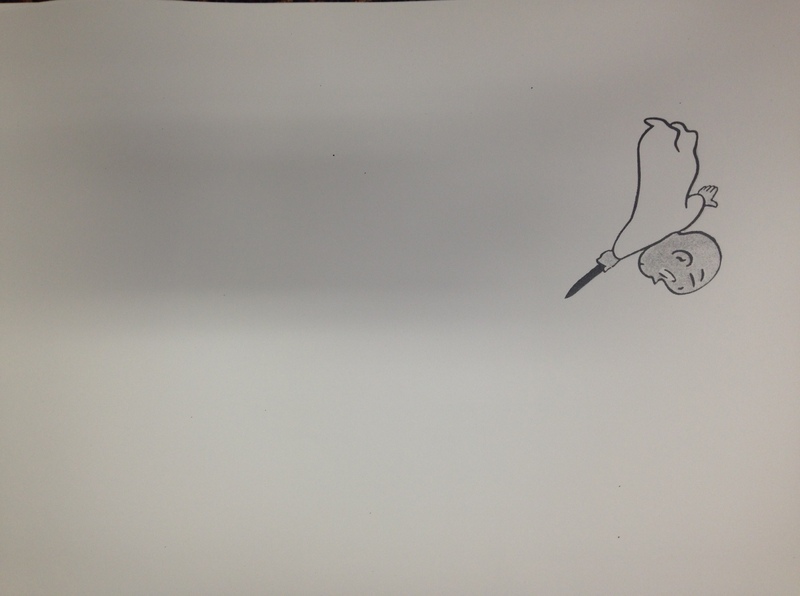 I enlarged a b&w picture of Harold from the book, and copied him in various random positions all around 12 X 18″ pieces of white construction paper, and set out purple crayons. I read the book to students, then after book checkout, they were able to sit down at the tables and create a picture of Harold drawing an adventure of their own choosing. 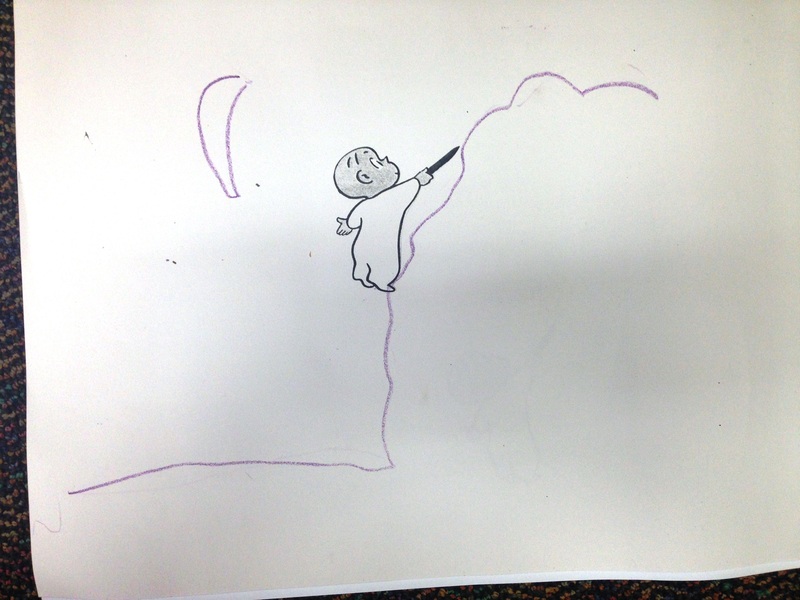 After seeing Harold’s imagination run wild with his purple crayon on the pages of the book, the students were excited to let their own imaginations take Harold someplace too. But don’t forget the moon. The moon always followed along. Where’s Waldo in the Library? As part of my elementary library orientation at the beginning of the year, I take advantage of the irresistible, universal childhood need to find Waldo, wherever he may be hiding. I printed and laminated multiple Waldo pictures in a variety of poses, Waldo’s dog, and Waldo’s girlfriend. 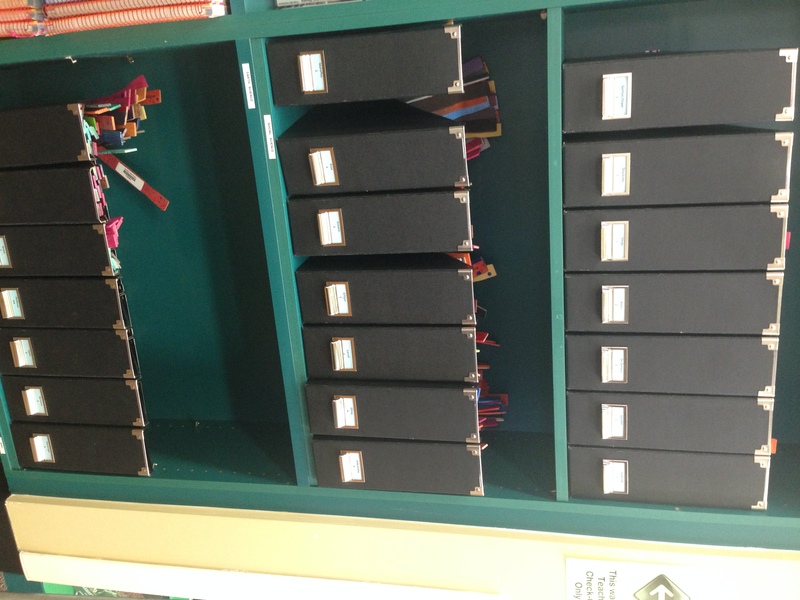 I tape them with blue carpenter’s tape around the library in different sections, hidden in plain sight. 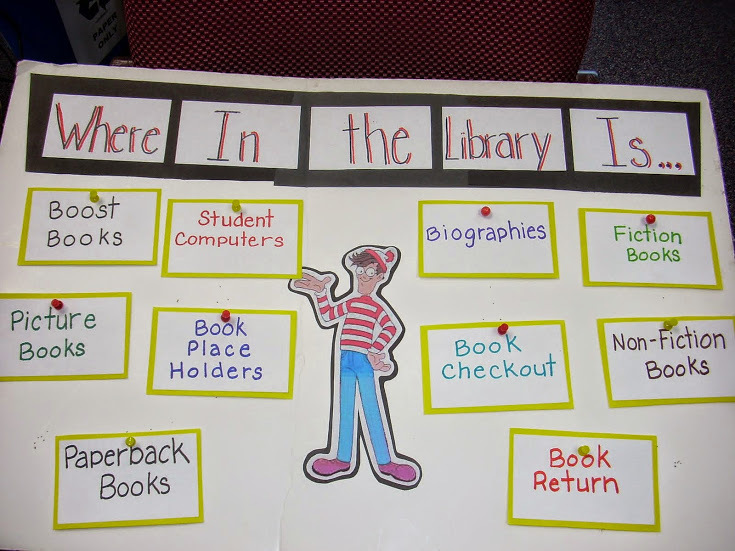 I hand out cards to random students, and ask them to stand up one at a time, and locate Waldo in the Fiction section, or locate Waldo in the Picture book section, etc. Everyone helps out with “You’re getting warmer/colder” comments, and it gets everyone’s attention, because, of course, everyone wants to visually locate him before the student who is actually charged with pointing him out. I have also worn a red and white striped shirt with blue jeans, to add to the fun. Where do you think I taped Waldo’s dog? In the 636 section, of course! 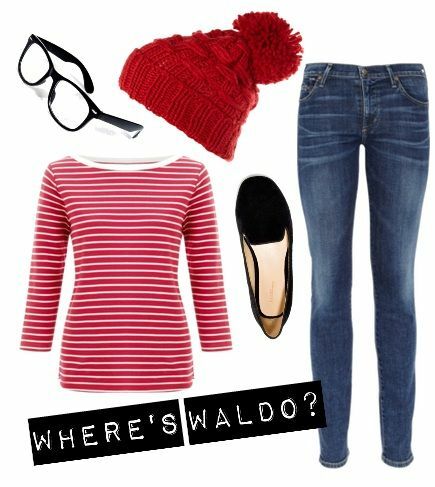 Ready for more fun with Where’s Waldo at the Library from Candlewick Press? 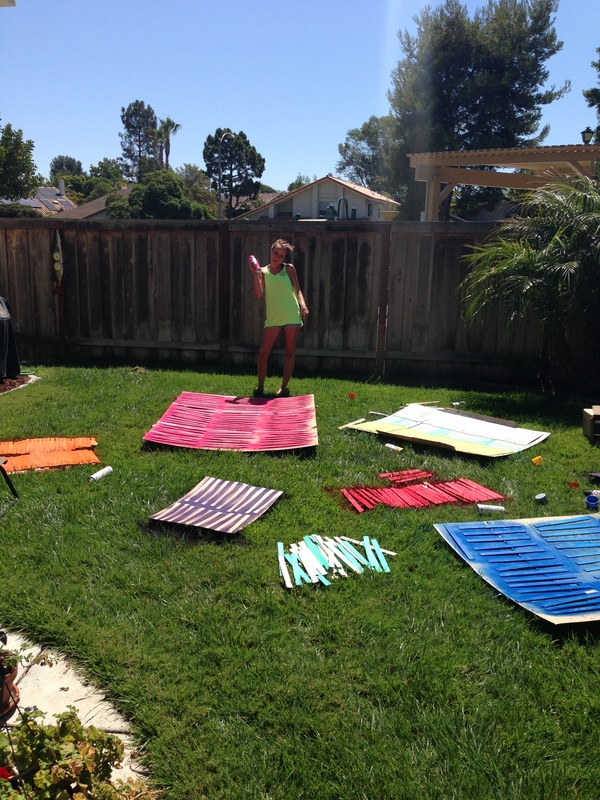 No Worries About Back to School! Who doesn’t get the jitters about the beginning of school? Not just students, but parents, teachers, administrators, and support staff too! I read back-to-school favorite, Wemberly Worried, by Kevin Henkes, with two Special Ed classes, and we read about all of Wemberly’s concerns. Then we talked about things we might worry about; I went first to break the ice. I confessed to worrying about whether I would remember teacher and student names (my first year at the school), and if students would like the books I read aloud. I didn’t know if any students would want to share their own worries, but I was surprised at how candid they were, once we got started. Worry stones are typically a smooth, hard, polished gemstone with an indentation for rubbing the thumb across, used to relieve anxiety. They were used in ancient Greece, Tibet, Ireland, and in Native American Tribes. (What do you suppose they worried about? I’d love to know!) Read more about the history of worry stones here. This website shows excellent pictures on how to make worry stones using Fimo Clay. Fimo Clay is inexpensive at Michael’s (you never go without your 40% off coupon, right? ), and it takes very little. I divided the clay into small segments in advance, and students selected three colors to make their unique worry stones. Students carved their initials on the bottom using an opened paper clip. I brought my little toaster oven from home (perhaps your staff lounge has one already), baked them for 20 minutes, and delivered them to the classrooms later. 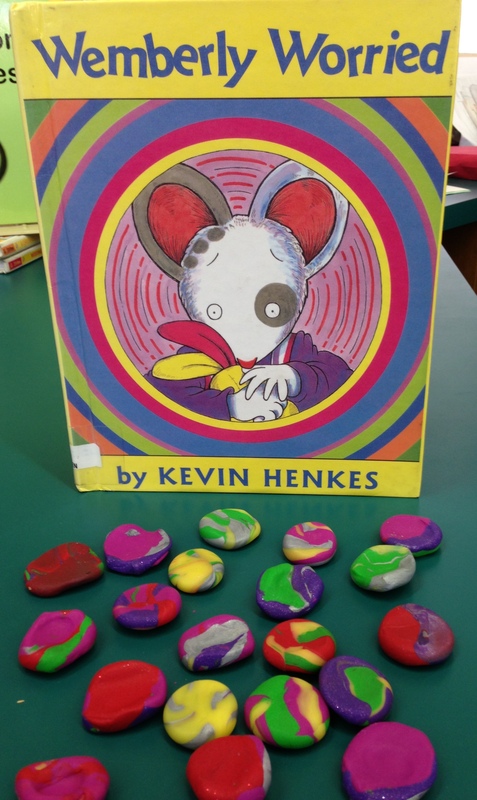 When we made them at the hour-long public library story time, children made the worry stones first, and I baked them while I read a few back-to-school books, so they were able to take them home with them right away. 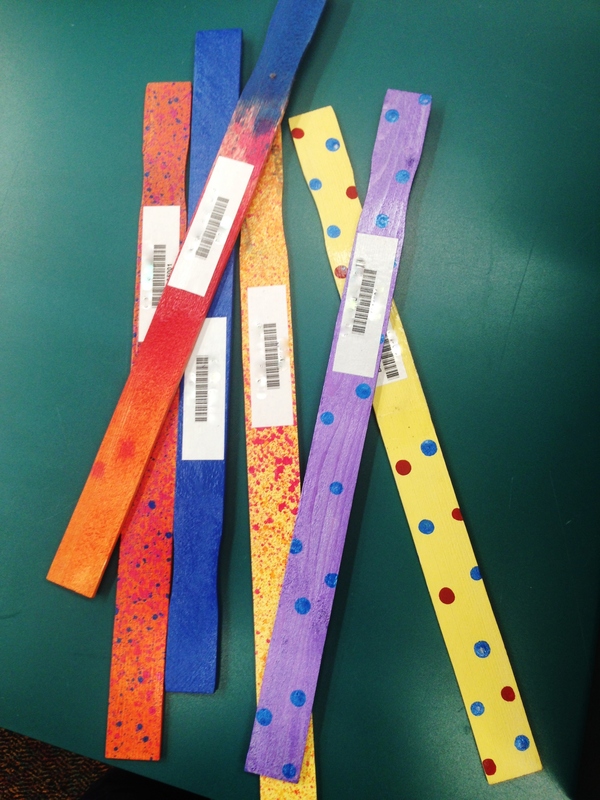 Tip: You may want to have a few extras made, so students who are absent are able to have one, even though they weren’t able to make their own. 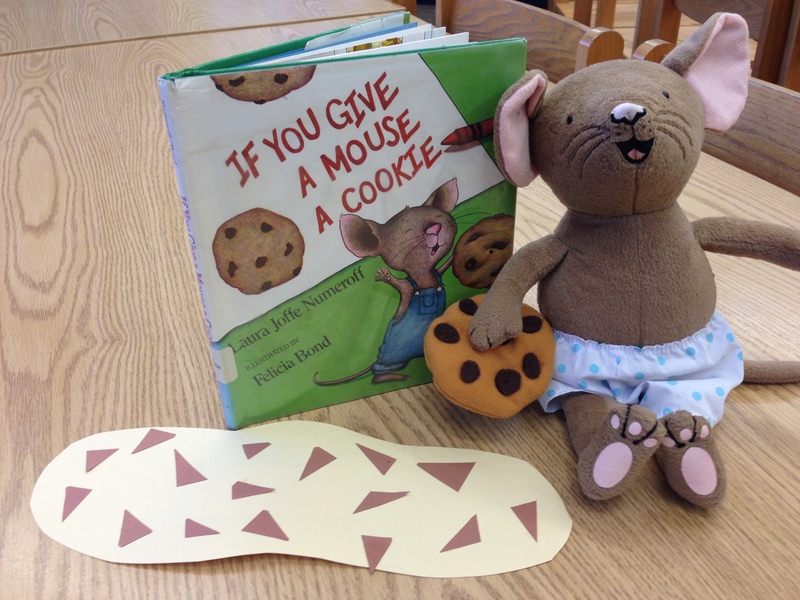 This engaging, popular story, If You Give a Mouse a Cookie, by best-selling children’s author Laura Joffe Numeroff, practically insists readers predict what the mouse is going to ask for next–a glass of milk, a straw, a napkin, and on it goes, until it comes back to needing another cookie. Many of the students had already heard the story, and were only too happy to pipe up with what the mouse would ask for next. A good book is like having dessert–it’s just as enjoyable the second time! A Black Dog with White Spots, or a White Dog with Black Spots? 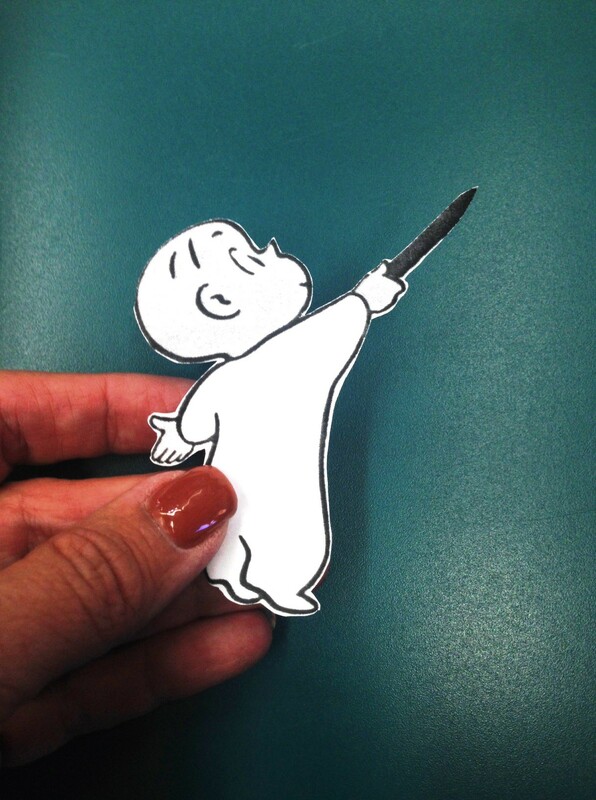 This storytime practically does itself. 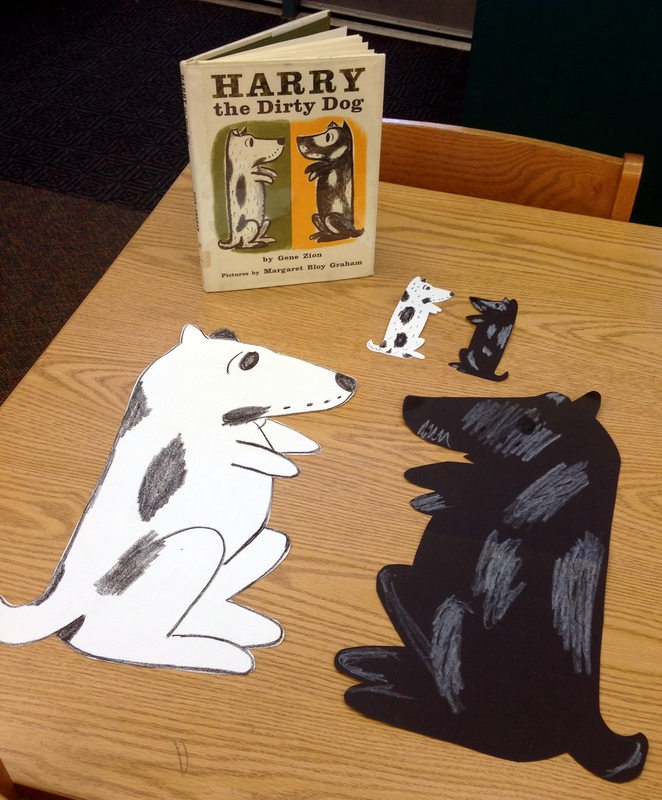 The classic tale of Harry the Dirty Dog, by Gene Zion, published in 1956, is just as appealing to kids today as it was then. What child can’t relate to not wanting to take a bath, and going to great lengths to avoid it? Harry’s antics are illustrated by Margaret Bloy Graham, and their simplicity lends itself perfectly to this successful project. 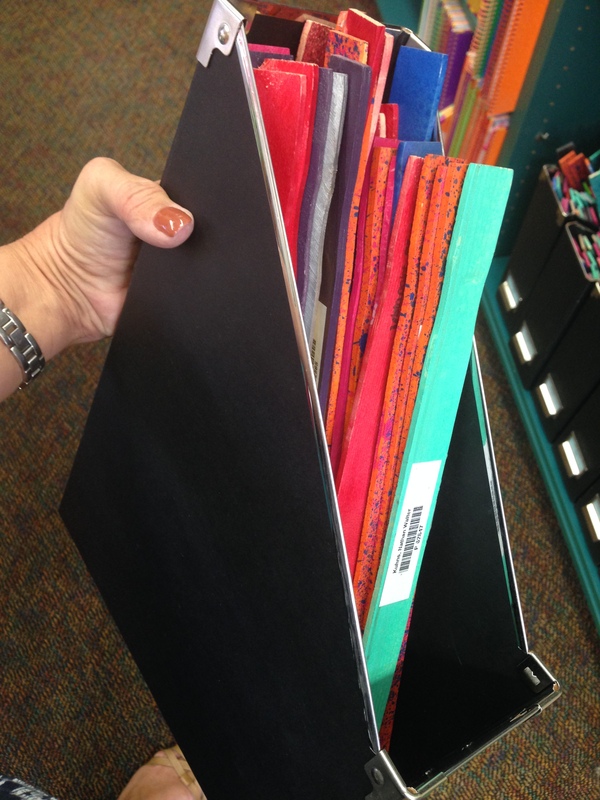 Supplies: Black construction paper, white construction paper, black Crayons, white crayons. Prep: I cut out 4 shapes at a time, using a pattern made from photocopying the book cover. Set up: Each student chose a place setting at the table with either a black or a white dog, and the opposite color crayon, and could make them as dirty or clean as they wanted. All of the classes made a small Harry, which can be used as a bookmark, but I asked one class to also make a large Harry that I could keep and display on a bulletin board, and they were happy to oblige. 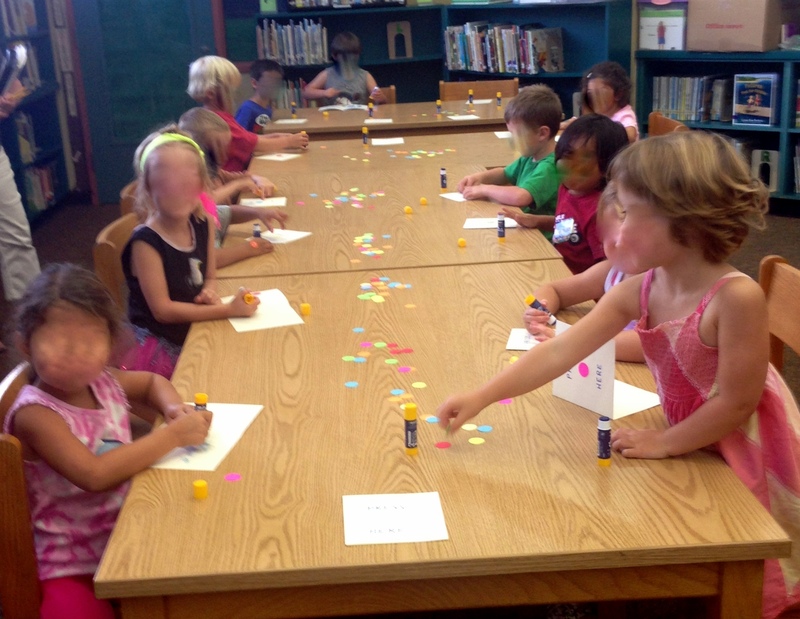 It generated some conversations, as students, parents and teachers walked through the library. Sometimes, it’s just nice to have a storytime with no glue to scrub off the table, and no paper cuttings on the floor to pick up. 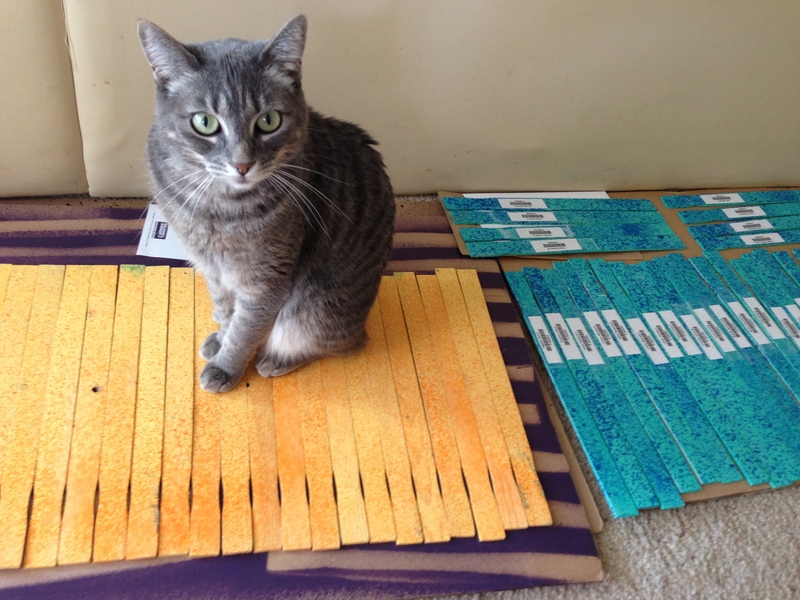 I use an Avery label template, 30 per page, but I use regular printer paper, cut it out and glue it on the back with glue sticks, because it’s less expensive. Sometimes, I can give the job to some upper graders who are happy to help at recess. “Did you see that?” she whispered to her teacher sitting next to her in the back row. “I’m making that happen!” That’s truly the magic of this simple book–letting kids feel a part of the magic. Actually, not merely a part, but the source! 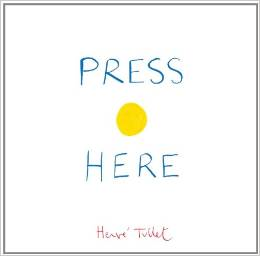 The charm of this book, Press Here, by Hervé Tullet, shines brightest when you read it to a group of kids, who can immerse themselves in the joy of discovery, and the delightful illusion of an interactive book. Each page invites the reader to press, tap, rub, blow, shake or tilt. 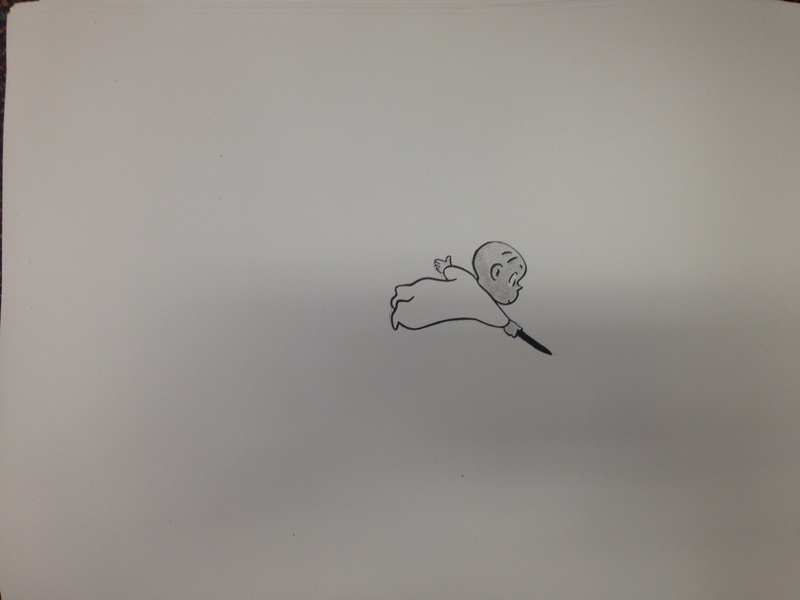 The ensuing results of the action are revealed when the page is turned. I held the book out to the seated students, and asked them to perform the actions directed on each page. I moved through the rows, letting each child have a turn. Everyone watched intently as their classmates took their turn, sometimes helping to count the number of taps out loud, or offering help with which is left or right. Then everyone was invited to predict (buzzword) what would happen on the next page. Of course, the number of pages didn’t coincide with the number of students in each class, so with some classes, a few had several turns, and in other classes, I let a few students redo a page we had already done, so everyone was satisfied with their participation. Students were then able to make their own Press Here books to take home. Prep: Cut and fold white paper into square cards. Write in blue marker “PRESS HERE” on the front cover. Punch out way more red, yellow and blue circles than you think you’ll need, and sprinkle them in the center of the tables, set out glue sticks. I was punching circles til my hands ached every night before school to resupply for the next day of classes. If you don’t have the patience for this, and want to spend the money, you can purchase round stickers at Office Depot. Consider limiting the number of dots children are allowed to use, as some got a little carried away with the fun of sticking them on. 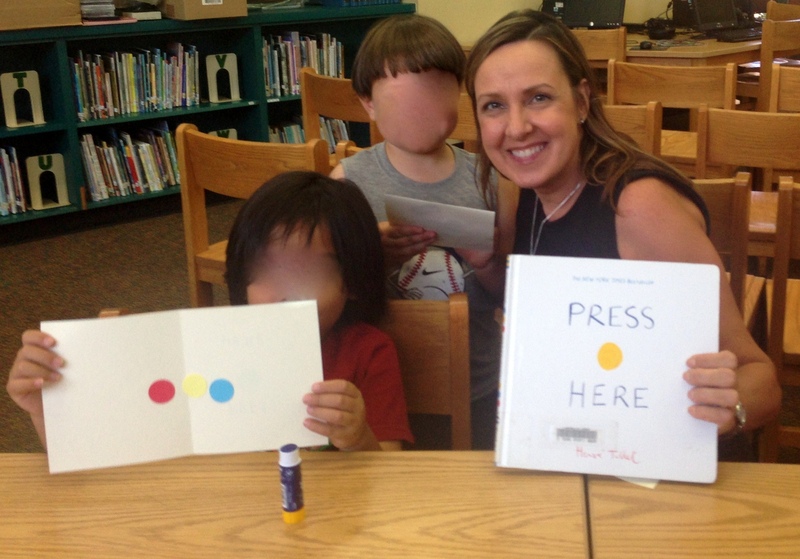 Student Instructions: Stick one dot in the center between the words PRESS and HERE. Add dots to the inside in any pattern or combination desired. and the magic is revealed!